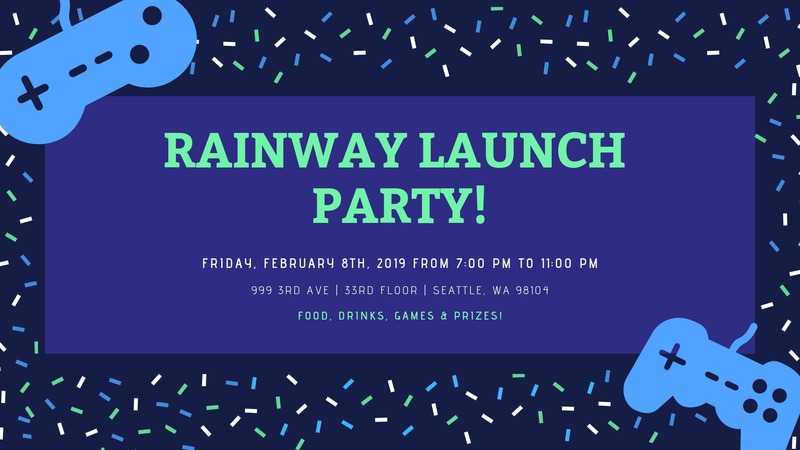 Rainway is officially launching and we want to celebrate! We're throwing a party and would love for you to be part of the fun. Enjoy beautiful views, pizza, video games and beer with the Rainway Team in Downtown Seattle. We'll also be raffling away some pretty nifty prizes! Sadly, no :( As much as we'd love to fly everyone out to join the big celebration, that's just simply not feasible. Flights & lodging will be at the expense of the attendee. Some form of ID will be required to enter the event, but all ages are welcome. There is no free parking available in the area. For any questions about the party feel free to contact us at community@rainway.io, make sure to include the header "Launch Party Question" when reaching out. ***Note to all attendees: Rainway reserves the right to take photographs and videos during the event and use them for promotional purposes. By entering the premises, you agree to be filmed, photographed or recorded. You also agree that all material collected by Rainway and its partners for promotional purposes throughout the world.